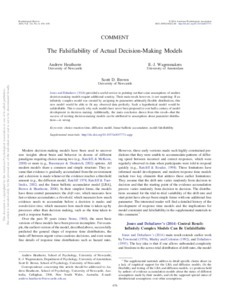 Jones and Dzhafarov (2014) provided a useful service in pointing out that some assumptions of modern decision-making models require additional scrutiny. Their main result, however, is not surprising: If an infinitely complex model was created by assigning its parameters arbitrarily flexible distributions, this new model would be able to fit any observed data perfectly. Such a hypothetical model would be unfalsifiable. This is exactly why such models have never been proposed in over half a century of model development in decision making. Additionally, the main conclusion drawn from this result—that the success of existing decision-making models can be attributed to assumptions about parameter distributions— is wrong.